We know that you are passionate about providing your clients with exceptional food experiences, making sure each and every detail is perfect. We are just as passionate and detail oriented when it comes to our work. Let our expert staff tackle your accounting and tax challenges, so you can focus on what you do best. 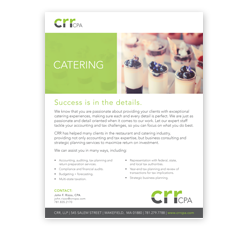 CRR has helped many clients in the restaurant and catering industry, providing not only accounting and tax expertise, but business consulting and strategic planning services to maximize return on investment.